Sharing a very valuable practice at this time of ascension that provides multiple purposes of which the first and foremost would be to shield one from outside (that out of Gods Law of One) from our energetic personal fields. With the use of this “shield” is purpose, functionality and effacacy grows. This shielding practice allows us to discern more of what our own energy body is, what is “ours” to manage, to clean up and upgrade. 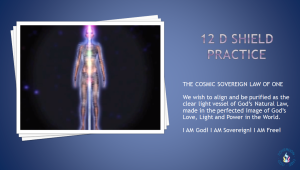 The “12 D ” shield is activating a connection to our understanding to our Lightbody. It also provides a context of understanding of our ascension journey and allowing us connection to our own higher intelligences. Brought forth to those awakening upon the planet at this time from Guardians and Stewards of physical and non physical Beings of The Universal Law of One assisting humanity at this time of great shift of the evolution of this planet. We are most appreciate and grateful for the sharing of this and much information from Lisa Renee at www.energeticsynthesis.com. As I resonate with this purpose, mission and my own realization and unfoldment of Guardian purpose and role, share that which supports all of us to better navigate the process in mind, body and spirit. To empower our cells to reawaken to our True Origin, including decoding light language and the hidden history of the human race. After this has been practiced with commitment and dedication on a regular basis, new levels of awareness will begin to emerge. Let this express itself freely and do your best to allow and do not place judgment on any experiences you may have. All of us are unique and may have different variations of experiences. This 5 minute video will help to provide a step by step process and visual that you can then begin, when comfortable, create without the video in your own mind when you command your personal space. A complete step through of this is below as well that you may print out and utilize personally until you are comfortable doing it without materials. From Lisa Renee as she speaks upon this process…. It is suggested to strengthen your aura and to build your body’s energetic strength in order to repel manipulation or obfuscation, which is confusion. My declaration of intention to serve my source: I commit to serve my highest power fully, completely and totally. I am God. I am Sovereign. I am Free! 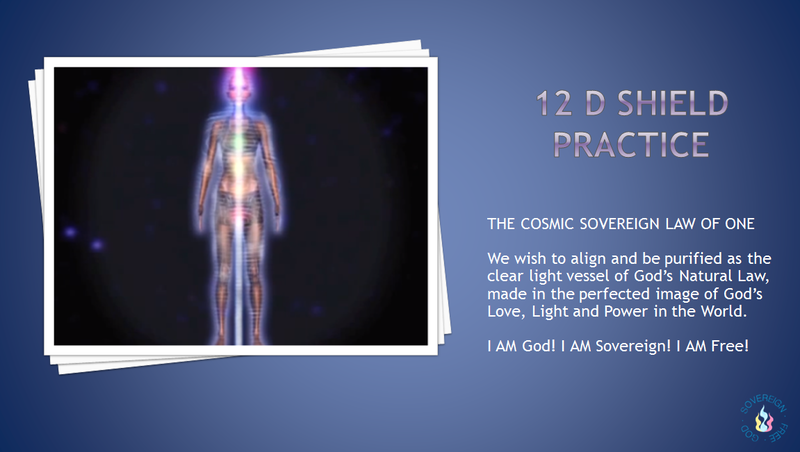 A core practice for me at in the community of Energetic Synthesis, is the 12th dimensional shield. 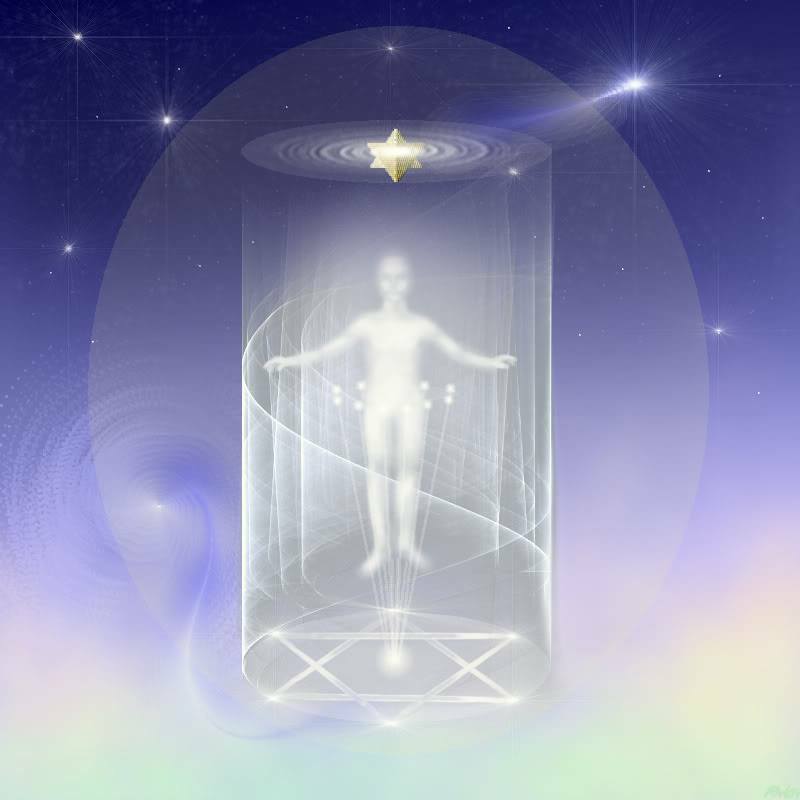 The 12th dimensional shield is a practice that fortifies and strengthens our aura by reconnecting us to our 12th dimensional blue print or Kryst or Krystal body. As we shield ourselves, we learn energetic boundaries of our aura. And then we can learn to boundary test our aura to discordant energies that are uninvited. The shield also helps us to re-imprint our body to physical and energy sustainability and health and this achieved by bringing balance to the body. It also allows communication to be restored with our spiritual forces and star family. It also empowers our body, ourselves, to re-awaken the wisdom of our true origins which may mean we start to decode light language or start to understand more about the hidden history of our planet and of our race. So as we work with the 12D shield, we use the six-pointed star, which is two triangles of Merkaba that is representative of our Merkaba body. Many of us are seasoned with this exercise but for many of us that are new and joining us now, let us go through the process of the 12D shield. Coming in to the center of your brain, visualize a nice silver six-pointed star, the Star of David in the center of the brain. This geometry means unity, unity of polarity coming in to oneness with God. Allow that six- pointed star to be in the inside of your vision in the center of your brain. Feeling that unity move that geometric pattern of the six-pointed star down your chakra column, the center line of your body, and see it release between your legs. You are going to send that all way to the core of the earth. And as you see your Merkaba star, your unity connected to the core of the earth, see that humongous Merkaba star in the center of our planet with all of your love, with all of your intentions sending unity of our planet, sending unity to every being on this planet. As you see a thick feed line of platinum energy start to gather around you from this connection. Taking inhaled breaths you may feel in imprint of a cool menthol kind energy as the platinum shield feels kind of cool like mentholated or eucalyptus. Memorize this imprint for it is: I am God, I am Sovereign, I am Free. It is the true Krystal origin of your connection with God force. As you embody this force, you become the promise that embodies it for all of humanity. With each inhale, as you feel your body start to connect with that frequency, again connect to that six-pointed star in the center of the earth and draw it up with your breath. As you see it returning back to you, have it stop in a position about 12 inches below your feet. This area beneath you is where the core mathematical signature of Krystal body as it connects into your aura exists. See your six-pointed star 12 inches below your feet and as you do you will see a platform, almost a circular horizontal platform emerge. This platform is your shield, it is your protector, it is that which builds the bottom of your spiritual house. It is your foundation to your spiritual house. So build that foundation. As you feel the firmness and the support building the foundation of your spiritual house in a circular platform, see your six-pointed star in the center of that platform. It is your core, it is your pillar, it is your strength and it belongs to you and no one else. This is your covenant and protection with God always. As you feel your foundation, now start to sense and see that your 12D shield, a platinum energy emits off your foundation and feel it building a circular pillar of platinum sparked white light around you covering your body, every cell and pore of your energy system emitting and connected to crystalline light of God. As it protects you, as it hold you, as it supports you, it is your foundation and it is your security. See it building over your legs and hips as it reaches your waist and your shoulders. Start to see it building above your head. You are going to intend to strengthen this pillar and build this pillar about 3 or 4 feet above your head. And this is the first dimensions to build your pillar in order to protect the personal aura body. If you bring your aura in and you want to protect the boundaries of your energy field – you can use this technique so that you can learn to test discordant energies and allow only that which is invited to impact your energy field. You are learning to boundary test. You are learning to create a boundary with your personal energy field before you can start to share this field with the planet and with others which will naturally happen as you become more stabilized and balanced in your own energy field. This process is called “commanding your personal space”. Allow the shield to build and see yourself fully encompassed in your personal platinum pillar from 12 inches or so beneath your feet to 3 and a half to 4 feet above your head, your entire aura, your entire body saturated and protected in this strong pillar of platinum light. And now we are going to build the same foundation on the top as you did on the bottom as you again in your inner vision – connect to the six-pointed star in the center of the foundation of your spiritual house. Let’s start to bring that six pointed star up through the center column of your body. Again the six pointed star represents the unity of polarities, unity of the inner masculine/feminine, it is all represented in this Merkaba star symbol as it we allow it to move up the body’s center column and see it release at the top of the crown chakra. Send that six-pointed star to the very top of your pillar of light and let it linger there for a moment about 3 to 4 feet above your body, right in the center above your head. See that thick white light building strength in your core. That is your monadic staff or your central vertical channel. It’s the structure where your chakras are built upon. If you cannot see this, just intend it for that is enough. In your vision, as you intend to put the six-pointed star 3 and half or 4 feet above your head see it start to build. It will start in its own movement of spinning to start to build yet another circular foundation above your head. You are protected below and you are protected above. As you create another lid to seal yourself inside your personal pillar of light , this is the roof of your house, the roof of your spiritual body. We are going to see that “lid” as a circular platform just like you did below on your foundation. Create a circular roof that is like your lid on top of your shield. And as you feel that roof firmly being built these are the spiritual energies of your inner god force. Seal that seal into the top of your platinum pillar of light. When this happens it almost feels like a hermetic seal as you are fully suspended in this protective light, fully shielded in your spiritual house and from this place you can use discernment, you can boundary test in all modalities and all decision and in all things that cross your path. If something becomes unclear or confused, allow it to be tested against your shield. Is it of your resonance? Is it not of your resonance? If it is not, do not fear it, let it go and move on your personal path. You are not missing anything. You didn’t make a bad decision. There is no mistake, only that which resonates with your personal heart-based God force and that which does not. So you again feel yourself suspended in the protective spiritual house and pillar of God’s light. Program it through I am God, I am Sovereign, I am Free and allow nothing that is not aligned with those frequencies to enter your field, to enter your shield. Finally focus on the six-pointed star, your Unity Merkaba symbol at the center of your personal pillar 3 to 4 feet above your head. You are now intending to ground multi-dimensionally by sending your six-pointed star out into deep space and into the connection with the Heart of the Universe, the heart of God itself. See your Merkaba Star flow away from the top of your shield through a platinum feed line all the way into the core of the Universe and grounding yourself into the center of the Cosmic Heart of the Universe. And now from the place of your shield, you are going to invite your higher self, God self and your Ascension Guides, those which are in alignment to your sovereign freedom and to your highest evolution and heroic probability as we establish the connection with your beloveds, with your spiritual family. You know you are never alone. You know you are fully supported. As you thank your Ascension guides, as you thank God, and allow yourself to be filled with peace, harmony, balance, and integration. Know that you are on the path of Ascension and on a need to know basis. And as you trust, you will receive all that you need in the moment. Learn to trust and listen to your inner spirit. Release all your worries, all of your doubt. Cast your entire burden to God now. In deep love and gratitude complete your meditation and seal your communication and intention.